Ubisoft has finally unveiled patch notes for Assassin’s Creed Odyssey’s 1.1.4 update, alongside a release date. The incoming patch, which adds New Game Plus, will go live tomorrow on February 26, 2019. AC Odyssey’s big February update will also provide support for Legacy of the Blade’s third episode, Bloodline. It’s a pretty sizable patch, weighing 5.7GB on PlayStation 4 and 5.5GB on Xbox One. The patch for PC is a bit smaller, clocking in at 4.7GB. Given the amount of content packed in the update, the download file’s size hardly seems surprising. In addition to New Game Plus and DLC support, Update 1.1.4 will add ten new frames to photo mode, offer accessibility improvements, and fix dozens of bugs across AC Odyssey’s DLCs and main game. For a full rundown of everything featured in the upcoming update, check out the 1.1.4 patch notes below. Do so at your own risk, however, since a few major story spoilers are mentioned. 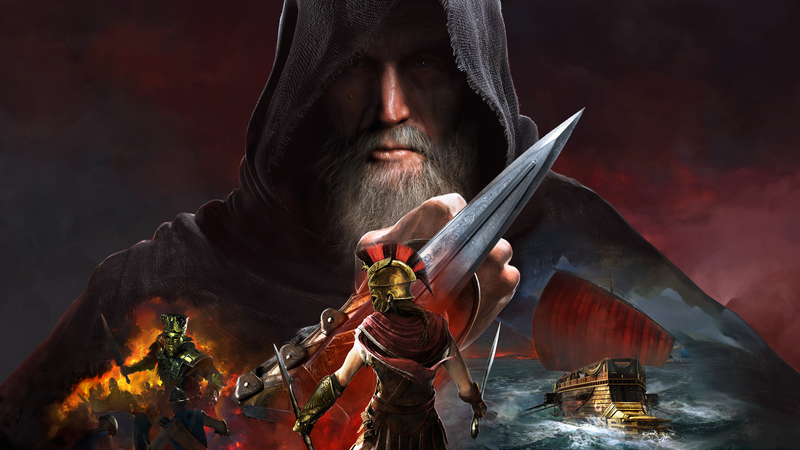 Increased Drachmae gained with Bounties and Conquest Battles. Added chance to loot Iron Metal and Soft Leather from sinking ship and looting floating loot. Scaled floating loot quantity based on player level. Lower chance to loot Precious Gem and Obsidian Glass from sinking ship. Increased Wood quantity from Epic Ship. Addressed various issues with the Protector of Persia quest. Adjusted a cutscene and tweaked some dialogue in Shadow Heritage. Addressed various issues with engravings and perks. Addressed an issue where players couldn’t obtain Nestor’s rewards under certain circumstances. Addressed an issue causing the big battle in Achaia to end before enemy forces were depleted. Special Lieutenants can be hired after multiple recruiting. Back to work, Misthios! Hephaestus declares players will no longer be lit on fire by candles or when lighting braziers in tombs. Invisible mercenaries will no longer be easy to track when activating the Multi-Shot ability. Say that again, but slowly. Rapid fire will now work as intended on the various NPC types. Addressed an issue preventing players from dealing damage when attacking with a melee weapon. Addressed an issue allowing the “Tamed animals deal poison damage” legendary engraving to be unlocked from the beginning. Addressed an issue causing players to spawn on a building when fast traveling to Georgios’ Reach. The Daughters of Artemis will no longer be hostile to players after becoming their leader or being provoked. Overthrow averted. Addressed an issue where Kallisto the Bear would leave the Arena invincible. Patrols will no longer grab corpses that were made invisible with the Death Veil ability. Addressed an issue preventing players from dismounting a horse while talking. Don’t ride and talk, Misthios. Addressed an issue causing several cultists to spawn underground. Players will no longer be swarmed by hordes of wannabe centaur NPCs when entering towns for the first time. Addressed an issue preventing players from looting Orichalcum fragments in several areas. Addressed an issue preventing players from purchasing items from Sargon if the item shared a name with one in their inventory. Addressed an issue causing too many mercenaries to rally to Mykonos under certain circumstances. Addressed an issue causing players to remain trapped in a room at the Farm of Elais. Addressed an issue preventing new weekly contracts from appearing until reloading. Addressed various issues that could prevent Belos the Beast, Cyclops, or Medusa’s minions from scaling to the player’s level as intended. Crane of Georgios can now be fast traveled to. Addressed an issue causing players to be stuck in the Leader House in Keos. Players should now be able to complete Trachis Fort. Addressed an issue preventing Myrrine from traveling to her destination. Addressed an issue preventing players from progressing in She Who Controls the Seas. Addressed an issue causing the objective to disappear in Persian Puppetry under certain circumstances. Addressed an issue preventing players from continuing A Family Legacy. Addressed an issue preventing players from continuing We Will Rise. Addressed an issue preventing players from completing Prince of Persia under certain conditions. [MOTHER OF ALL SPOILERS] Addressed an issue in Ancient Revelations preventing players from killing Pythagoras. Addressed an issue causing the Find and Rescue the Actor objective in The Curse of Fame to display incorrectly. Main quests will now appear after completing the Unearthing the Truth quest. Addressed an issue during Awaken the Myth preventing players from completing the Sphinx after defeating Stentor inside the Arena. Addressed an issue during Heart for a Head where the quest item was not available in player’s inventory. Addressed an issue preventing players from triggering the cinematic to complete A Fresh Start. Testikles will remain alive for players to pick up in Delivering a Champion. Addressed an issue during A Good Toast where an invulnerable NPC could be found in the Leader House. Addressed an issue preventing players from beginning More Questions Than Answers if fast traveling when the letter was open. The quest item located in the chest at the Cave of Arktoi will now be available in Hard to Artemis. Addressed an issue preventing players from receiving the By the Fates quest. Addressed an issue preventing players from completing the On the Grapevine quest if killed, upon respawn. Addressed an issue allowing the ship of Nestor the Formidable to be destroyed by enemy ships. Addressed an issue where NPCs would no longer follow their objective after saving or loading in Learning the Land. Addressed an issue causing the Daughters of Artemis to remain invincible after completing Daughters of Lalaia. Addressed an issue preventing players from interacting with Barnabas to complete A Night to Remember. Addressed an issue preventing players from completing Hunter Camps after finishing Daughters of Artemis. Addressed an issue preventing Athenian ships from entering into conflict with the Adrestia in The Battle of Pylos. [SPOILER] Daphnae can now be killed in deep water during Artemis’s Request. Addressed an issue preventing the legendary boar from dropping its pelt during Daughters of Artemis. Addressed an issue preventing players from completing the Poison in the Air weekly quest. Addressed an issue preventing players from completing the Burned Bodies and Broken Skulls weekly quest. The Clear the Land for Athens contract will now generate where Daughters of Artemis spawn. Addressed an issue with the Ostraka Killer View. Addressed an issue causing Mercenary’s pets to attack if players shoot fire arrows at them. Also: please don’t shoot arrows at any pets, thanks. Addressed a variety of inappropriate NPC reactions. Addressed a variety of incorrect player controller actions. Using the reset option will now function as intended in Photo Mode. Addressed an issue causing Depth of Field to be disabled when using the left stick while editing in Photo Mode. Addressed an issue in Photo Mode causing Bloom to be very dim. Addressed an issue causing flickering in Photo Mode under certain circumstances. Addressed an issue preventing some players from boarding when prompted. Addressed an issue preventing the game from autosaving when entering open waters or calling the Adrestia. Increased the Adrestia’s health regeneration rate when players are out of combat. Ship upgrade stats will correctly be reflected in the player stats card. [PC] The Aim action toggle is now working for Naval combat. Addressed an issue preventing players from upgrading the Adrestia. Addressed an issue where DLC Lieutenants needed to be manually reassigned. Addressed various issues causing long loading times. Addressed a game crash when the cinematic for the Cyclops begins. [PC] Addressed an issue causing low FPS when using the latest Nvidia drivers on GTX 1060 Max-Q GPU. [PC ] Addressed an issue causing juddering and unusual CPU usage on some laptops. Addressed various graphical issues with world objects. Addressed various visual effects with weapons and outfits. [PC] Addressed a graphical issue that could occur if 8 GB VRAMs reached maximum capacity. The “!” above the Inventory tab will now disappear after players have hovered above the acquired items. Praise be. Recruiting enemy NPCs will no longer add to the quest objective counter if asked to “kill” enemies. When using the All filter in the menu, Chapter and Legacy quests will be in order. Addressed an issue causing background flickers in the Options menu. Rewards for defeating the Mythical Creatures will now be displayed in the quest description. Addressed an issue where the Transmogrification menu wouldn’t become available as intended on Level 8. Mercenary Tier S2 players will be granted Hephaistos’s 20% discount in the Workshop, as intended. Addressed an issue preventing players from gaining Ability points after reaching 207. Addressed an issue causing the 200 Free Helix Credits to be missing. [Spoilers] Addressed an issue preventing players from being rewarded the Abraxas horse skin when reaching the Tier 1 Mercenary rank. [PC] Corrected several CPU and GPU miscalculations displayed in Performance Analyzer. [PC] Addressed an issue preventing players from scrolling through detailed stats with the mouse wheel. [PC] Addressed an issue preventing the HDR option from applying correctly. [SWITCH] Added support for the in-game store on Nintendo SwitchTM sytsem. Changed the description of the Lord of the Seas achievement to match new progression. Addressed an issue that prevented Legacy of the First Blade achievements from unlocking. This massive update serves as but another example of how Ubisoft continues to support Assassin’s Creed Odyssey. Since launch, the franchise’s latest entry has undergone a slew of changes. For example, one of the earlier patches added in a number of customization features. Another update made available a multitude of new character abilities.